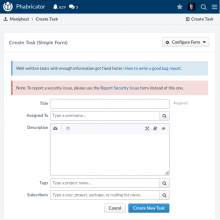 This blog post will describe a bit about how we are utilizing the "Task Types" feature in Phabricator to facilitate better tracking of work and to streamline workflows with custom fields. Additionally, I will be soliciting feedback about potential use-cases which could potentially take further advantage of this feature. 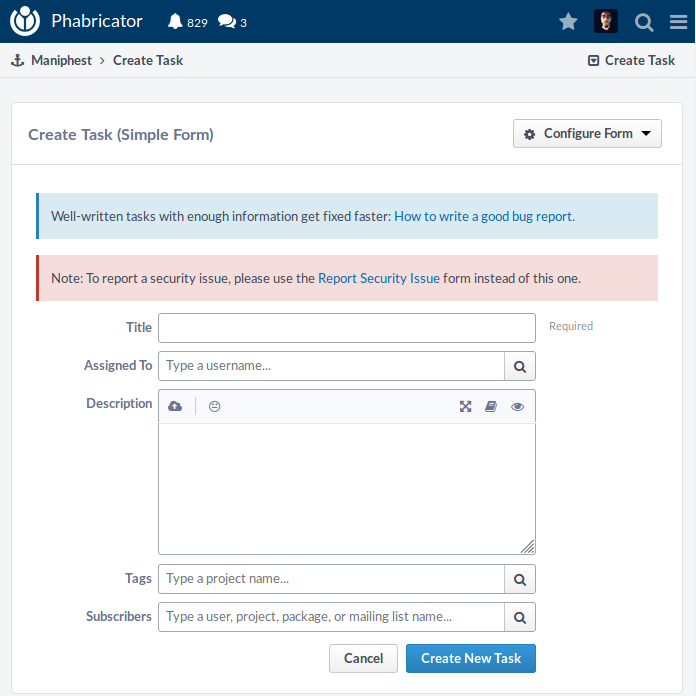 Task Types are a relatively new feature in Phabricator which allow tasks to be created with extra information fields that are unique to tasks of a given type. For example, Release tasks have a release date and release version which are not relevant for other types of tasks. Another task type that has been recently introduced is the deadline type. Deadlines include a single extra field Due Date which is displayed at the top of the task view as well as on workboard cards. Task types have the potential to streamline workflows and support the use of Phabricator for collecting structured data. One proposed use of task types is for collecting specific information in bug reports and feature requests. 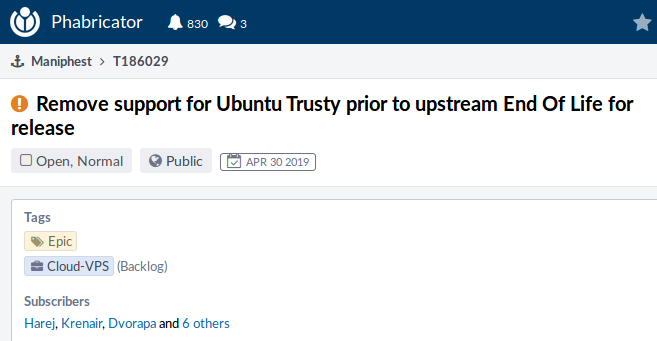 Bug reports, for example, might ask for OS or Browser version in separate fields to aid in sorting and searching through reports. 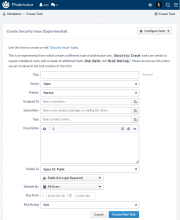 Another potential use-case which is currently being developed is a security issue task type. 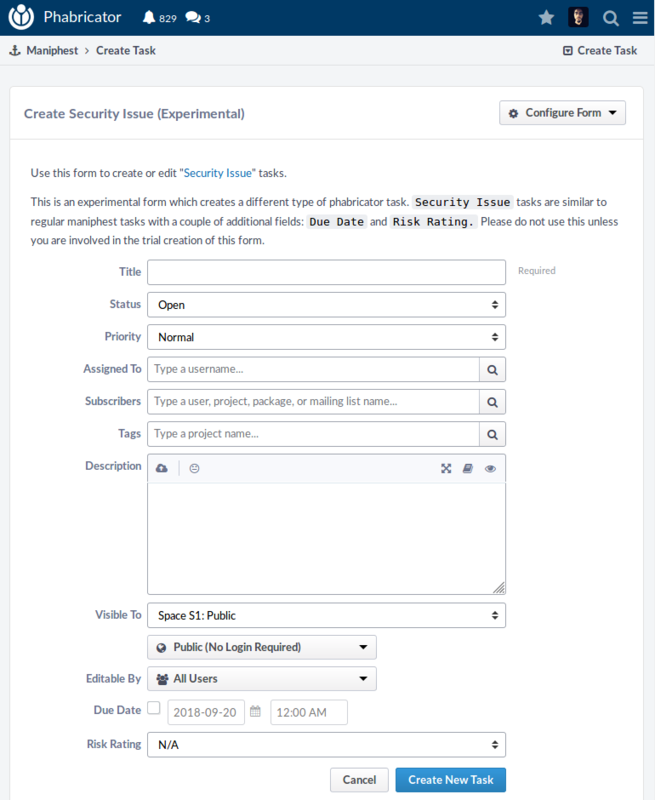 This will allow the security team to add fields relevant to security issues without cluttering the task form used by everyone for other types of tasks. Custom forms can be created which hide irrelevant fields and generally streamline the process of submitting a task for a given workflow or for a team's specific use-case. This is a great feature in Phabricator and we have made extensive use of it for various purposes. The drawback to custom forms is that they are generally only useful for submitting tasks. Once a task is created, editing takes place on the normal "generic" task edit form. It's now possible to assign a type to a form. Now it's possible to configure forms so that whenever you edit a Security task you always see the Edit Security Task form. Thanks to typed forms, we can now add custom fields which are always visible when editing one type of task but hidden when editing other types. Written by mmodell on Sep 20 2018, 5:22 PM. "Love" token, awarded by kostajh. "Love" token, awarded by Quiddity.